The guest house is situated in historical Toddington in the county of Bedfordshire. 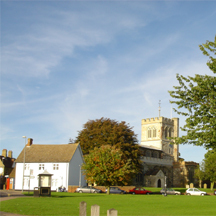 A large village with a population of 5000, Toddington is close to London enjoying excellent road, rail and air links. Toddington Guest House is your ideal stop over whether for business or pleasure. Toddington Manor - Originally built as a palatial residence in 1560, Toddington Manor is now a popular tourist attraction with over 10 acres of gardens. Whipsnade Zoo - One of Europe's largest wildlife conservation parks covering more than 600 acres and home to more than 2500 animals including many endangered species. Woburn Abbey - A beautiful stately home set in a 3000 acre deer park and home to the Dukes of Bedford for nearly 400 years. Woburn Safari Park - A real escape into the wild! Steer your car along the safari drive and see a wide range of animals up close and personal! Toddington Guest House is well connected via a number of different means of transport. Please go to our directions page for details on how to find us.